The New Canon Digital Rebel XT features 8.0 megapixels, an APS-C Canon CMOS sensor, DIGIC II image processing, and a wide range of custom and manual controls in a smaller, lighter body. LAKE SUCCESS, N.Y.--(BUSINESS WIRE)--Feb. 17, 2005--The Canon EOS Digital Rebel(R) camera that rocked the world of consumer digital SLRs little more than a year ago now has a new, faster, even smaller, big brother. Sibling rivalries aside, the 8.0 megapixel Canon EOS Digital Rebel XT SLR, which will be showcased at PMA 2005, February 20-23 (Canon Booth #3503), in Orlando, Fla., adds resolution, speed, an extra dollop of creative control and enhanced comfort in the hand, to one of the smallest and lightest digital cameras in its class. Despite its advancements in ergonomic design and technology, this easy to use EOS digital camera is compatible with all of Canon's EF lenses including the EF-S lenses and still retains the sub-$1,000 price point, proven crucial to entry-level digital SLR consumers. "As we have with the Digital Rebel's 35mm film-based cousins, we are expanding the line-up of Digital Rebel SLRs, offering consumers a wider variety of features and price points based on their needs and budgets," said Yukiaki Hashimoto, senior vice president and general manager of the consumer imaging group at Canon U.S.A., Inc, a subsidiary of Canon Inc. (NYSE:CAJ). "Even though we have increased the resolution, speed, responsiveness and energy efficiency on the new EOS Digital Rebel XT camera, we have decreased its size and weight, making it more comfortable to hold and use. Indeed, it is nearly three ounces lighter and more than a half-inch smaller than the original EOS Digital Rebel model." In stores beginning in March, the EOS Digital Rebel XT camera will take its place alongside the original 6.3 megapixel EOS Digital Rebel camera that first placed an affordable, high resolution digital SLR into the hands of Canon consumers. The EOS Digital Rebel XT model is offered in two kit configurations: with and without Canon's high-quality EF-S 18-55 mm f/3.5-5.6 zoom lens. The estimated street price for the zoom lens kit will be $999* while the estimated street price for the body only kit will be $899*. The original Digital Rebel will be available at the same time for a reduced estimated street price of $799* for the zoom lens kit. Standard accessories in both camera kits include a battery pack and charger, software, manuals, interface cables, neckstrap and Canon U.S.A. limited warranty. The EOS Digital Rebel XT camera will be offered in both the stylish brushed silver patina and the sleek Canon matte-black finish. While many of the feature advancements and innovations on the new EOS Digital Rebel XT digital camera are inherited from Canon's recently introduced EOS 20D "prosumer" SLR (which carries a and estimated street price of approximately $1,599*), the two cameras' most striking technological similarities are their use of Canon's newly-developed, large single plate, high sensitivity, high resolution color CMOS imaging sensor technology. While the size of the APS-C CMOS sensor on the EOS Digital Rebel XT SLR is fractionally smaller than the APS-C CMOS sensor on the EOS 20D camera (22.2 x 14.8 mm versus 22.5 x15.0 mm respectively) accounting in part for the cameras 8.0 vs. 8.2 megapixel resolution rating, individual pixel dimensions are identical, and they both provide the same effective angle of view, equivalent to 1.6 x the normal EF lens focal length. "As tempting as it is to compare the EOS Digital Rebel XT digital camera with the more advanced EOS 20D model based on their technological kinship, there are, of course, some very real differences between them. While the 20D SLR includes performance features such as faster continuous shooting speed (five frames-per-second (fps) vs. three fps) with larger burst capability (23 frames vs. 14) and custom function settings (18 vs. 9) that more than justify its heftier price tag, this new Rebel XT model was created for those dedicated SLR users who are migrating to digital for the first time and do not wish to give up the flexibility that an SLR system offers," explained Hashimoto. "For that discerning yet still entry-level digital SLR consumer, having the EOS Digital Rebel and the EOS Digital Rebel XT cameras to choose from is Canon's latest one/two combination, and it's a real knockout." The new EOS Digital Rebel XT digital camera can shoot up to 14 consecutive Large/Fine (8.0 megapixel) JPEGs, five RAW files, or four RAW + Large/Fine JPEGs at a rate of up to three frames-per-second. The EOS Digital Rebel camera's smaller buffer permits bursts of only four Large/Fine (6.3 megapixel) JPEG or RAW frames at a rate of up to 2.5 frames per second. While reprising the Digital Rebel SLR's ISO range of 100, 200, 400, 800 and 1600, Canon raised the Auto ISO setting on the Digital Rebel XT model to 400 in order to help improve image quality, reduce camera shake and brighten the scene behind the subject when taking a flash photo. The new Digital Rebel XT camera also offers 12 exposure modes that are user selectable at the turn of a conveniently placed dial. The exposure modes take into account virtually all shooting conditions and preferences are: Full Auto, Portrait, Landscape, Close-up, Sports, Night Portrait, Flash Off, Program AE, Shutter speed-priority AE, Aperture-priority AE, Manual and Auto Depth-of-Field AE. In addition to its lossless compression 8.0 megapixel RAW image file option, the Rebel XT Digital SLR offers users the option of shooting in a range of sizes and quality JPEG settings (based on shooter's preference, need and end-use requirements) from large (8.0 megapixels) and medium (4.15 megapixels), to small (2.0 megapixels). Within each resolution option, the user may also select quality settings: large/fine, large/normal, medium/fine, medium/normal, small/fine and small/normal. What's more, where the original Digital Rebel camera required dedicated software to extract embedded middle/fine resolution JPEGs from the larger, uncompressed RAW image file, the new Rebel XT model saves RAW and large/fine resolution images as separate files on the Compact Flash card. The user also has the option of selecting RAW (8.0 megapixel) files only, saving valuable space on the CF card. As with the EOS 20D, the Digital Rebel XT camera's RAW files are denoted by the CR2 extension. Among the new features found on the EOS Digital Rebel XT camera are user selectable metering and AF modes, flash exposure compensation control, improved E-TTL II evaluative flash metering and for the first time in this product category, custom function control. The Digital Rebel XT SLR even offers a monochrome mode for consumers who enjoy the subtleties and shadings that only black and white images offer. These additional controls greatly increase the creative power of the Digital Rebel XT, without taking away any of the automated functions that made the original Digital Rebel so popular with beginning photographers. 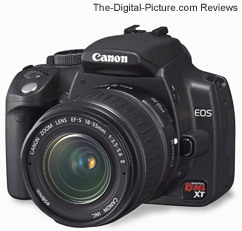 The Rebel XT camera incorporates nine of the Custom Functions previously found on the EOS 20D model. Designed to fine-tune camera operation according to personal preferences, the custom functions offer users a set of programming options for the SET button/Cross keys, as well as control over long exposure noise reduction; flash sync speed in AV mode; AF start from the shutter button or AE lock button; AF assist beam; mirror lockup; E-TTL II metering patterns, and shutter curtain sync. Canon's newest and most powerful SLR imaging engine, DIGIC II provides high-precision and high speed, natural color reproduction including high-saturation, bright subjects, improved auto white balance, along with increased white balance correction control and white balance bracketing (another legacy of EOS 20D advances), compared to the original Digital Rebel camera. The white balance correction control is a digital color filter that works like a light balancing filter or a color-compensating filter. Both the blue/amber bias and the magenta/green bias can be adjusted to +/- 9 levels. While the blue/amber bias adjustment is standard on the original Digital Rebel model, the Rebel XT camera's additional magenta/green bias adjustment provides increased color compensation from the earlier model. The Rebel XT SLR's white balance bracketing mode enables the camera to automatically take three images for every shot snapped, each with a different bias setting. The user can then select the best shot and discard the other two. White balance bracketing can also be used in combination with white balance correction. The benefit of all of this white balance wizardry can be found in the photographs with colors captured accurately and precisely under a wide range of conditions. In addition to the legion of image quality improvements, DIGIC II speeds up the camera's performance from start up that is ten times faster on the EOS Digital Rebel XT model than it is on the EOS Digital Rebel with the original iteration of DIGIC (.2 of a second on the EOS Digital Rebel XT model compared with 2 seconds on the EOS Digital Rebel camera). Utilizing the same 7-point autofocus system as the EOS Digital Rebel camera, the new EOS Digital Rebel XT SLR is capable of analyzing where a subject is -- even when it is off center - and almost immediately bringing it into focus. It can also analyze subject movement and automatically select locking or tracking AF modes as needed. These features simplify the camera's operation and optimize its performance. The Digital Rebel XT allows users to select locking or tacking AF modes independently, adding a new dimension of creative control. What's more, even though both Digital Rebel SLRs use that identical 7-point autofocus system, the Rebel XT model's new DIGIC II chip actually help increase the speed of autofocus calculation and hence the responsiveness of the autofocus itself. For greater creative control, both cameras also offer users the option of automatic and manual focusing point selection. Another feature improved by the presence of DIGIC II is the speed of the direct printing function, which is PictBridge compatible. DIGIC II also produces faster startup times, faster CompactFlash card writing speed; and approximately 10X faster data transfer speeds thanks to the processor's new USB 2.0 high-speed interface. As an added bonus, the DIGIC II chip is so efficient, it actually reduces the EOS Digital Rebel XT camera's power consumption (and extends battery life) by approximately 35%. Indeed, this new Rebel XT camera is so energy efficient, it is powered by the same lighter-weight NB-2LH battery pack used by the PowerShot S60 (as opposed to the larger BP-511A battery pack used by the original Digital Rebel model). While the NB-2LH battery and charger are included with the Digital Rebel XT camera, both a new vertical grip (BG-E3) that accepts up to two NB-2LH battery packs or six AA-sized batteries and an AC Adapter Kit (ACK700) for powering from an AC outlet, are available as optional accessories. The new Rebel XT camera also features the next step in the evolution of evaluative- through the lens exposure control, E-TTL II. Though compatible with all Canon EX-series Speedlites, this "smarter" new E-TTL II system helps ensure that, even in situations with highly reflective subjects or backgrounds or when shooting in most other similarly difficult lighting situations, the image will be optimally exposed. The E-TTL II system compares the ambient light with the reflected pre-flash off the subject reported in all 35 metering zones and selects the areas with a small difference to be weighted for flash exposure calculation. This system also helps eliminate or underweights areas with large differences, recognizing them as an extremely reflective object in the background or a highly reflective subject. Both the Rebel XT Camera and lens kit and the body only kit are shipped with three software discs including EOS Digital Solutions Disc 10 featuring ZoomBrowser EX, ImageBrowser and ArcSoft PhotoStudio together with other utilities, another disc containing Digital Photo Professional 1.6 for RAW file conversions, and a third disc containing PDF versions of the instruction manuals for each application.